Twitter Chat is an amazing way to connect with your audience, while increasing and expanding your authority. Think about it as a live Twitter event, normally based on a specific topic. The main key is the hashtag chosen. As well as the time zone established, in order to meet together with moderators, guests and hosts. Let’s see how to start your own Twitter chat. As mentioned, a specific hashtag must be chosen, and all the tweets of participants must include it. Think to a Twitter Chat as a live conversation, where people interact and bring their experience, based on the main subject. In order to participate, just send a tweet during the time selected, using the specific hashtag. If you don’t want to participate, you may want to simply follow the Chat by searching within Twitter the main hashtag. Just go to Twchat.com and connect your Twitter account to sign in. 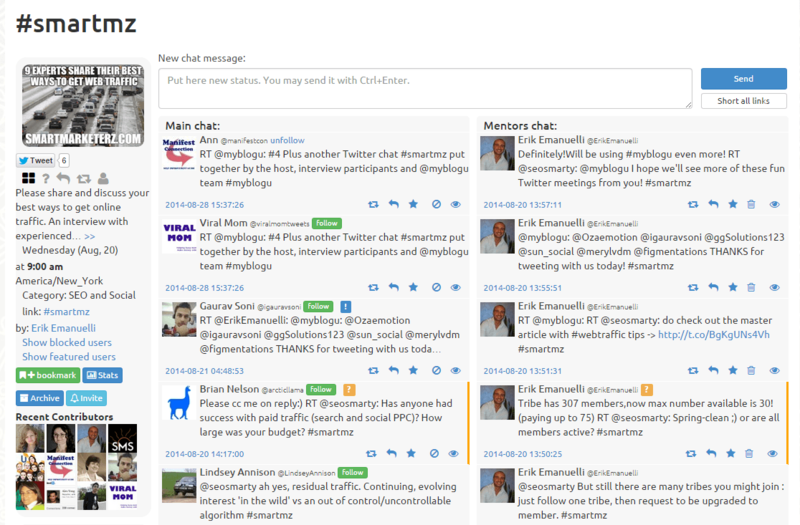 This site will help you to easily create, organize and manage your Twitter Chat. There are 3 main things you need to care about, when creating your first Twitter Chat. First step, choose a time that can be suitable for all the participants (I’ve organized my Twitter chat for 09:00 a.m. America/New York time, while in Europe/Rome was 15:00 p.m.). You should consider your demographic target when picking the time. Second step, think about a topic. Normally, the chat will be focused around a specific argument and you should organize a full schedule, divided into few sections. My Twitter Chat lasted one hour, more or less, with 3-4 segments. So for each one think about dedicating 15-20 minutes. This time will be enough to let participants engage and bring their thoughts. The last step will be choosing the hashtag. Think about something short, and unique. It must be used just by you. I’ve chosen #smartmz, to make reference to my blog “Smart Marketerz“, where the article has been posted about the main topic (sharing the best ways to get web traffic). The shorter, the best, as it must be included in every tweet of the users and should be easy to remember and to type. This could be the most difficult task. So think about it carefully and keep it simple! How to get traffic from Reddit? After you have completed the three main steps and scheduled your Twitter Chat, it’s time to start the promotion and let people know about it. First, announce it on your blog. Be sure to include the time, the topic chosen and most important, the hashtag! Let your website and newsletter readers know how a Twitter Chat works. You could write a detailed article yourself or find a guide somewhere else (you may want to link to this post). After this, market your event via social media. Facebook, Google+ and of course, Twitter (be sure to inform your followers). You can also contact people directly to invite them to participate. Be sure to send them a reminder one day and few hours before the Twitter Chat begins! I have been guided by Ann Smarty, who is very expert in this field. She helped me with questions and with the management of the chat. In your Twitter Chat, you should have at least another person who is going to assist you. Just think about the tweets that are going to come in could be huge in number! If there are many participants, be sure to nominate more than one moderator, included yourself. You need to handle requests, questions, fights or even SPAM! Finally, be sure to have in mind your goals. – What you want to get from it? – Do you aim to create a connection with your audience? – Do you want to increase your reach? – Are you trying to expand your Twitter followers? – Are you working on your authority? Keeping in mind your goals will help you conduct the live event. To the next Twitter Chat! Once the live chat is ended, you can still get benefits from it. Don’t let this conversation ends. Embed the tweets on your blog (you can use Storify to aggregate the live chat). Also, you may check the results of your even looking at the data. There are many interesting online tools like Hashtags.org, which you can use to get details about the velocity of the tweets along a timeline, with relation to your hashtag. Finally, don’t be disappointed if your Twitter Chat won’t result in an amazing event. You could always improve with your next one! As you know, with experience it will be better next time. Have you ever created a Twitter Chat? Are you going to create your first Twitter Chat, then? Twitter Chats are awesome! Great topic today! For newbies, they should also look at the correct timezone. This is probably the most used reason for missing chats. Another thing is using Tweetdeck. A lot of people, like me, prefer apps. So I would suggest using tweet deck and create a column there to follow the hashtag and even other chats that are happening. One final note: Archive the best tweets/answers. A regular blog post with those embedded will get you a lot of extra engagement (usually from users whose tweets you’ve embedded on your post) after the chat is over. Queueing this up on Buffer! glad you had an awesome experience with Twitter Chat. And thanks for adding those suggestions. I guess that with the hashtag, the time chosen is the best important part of a successful Twitter chat. I have never held or been part of a Twitter Chat. Sounds cool, and I would like to test that out soon. That might be a great way to reach new people. I am much more into webinars, and some how that sounds easier for me. But that is probably because I like to show things, and not only talk about it. But for hot topics the Twitter Chat must be fun! Twitter Chat is a great way to discover new things, learn from each other and increase your audience. You may want to just participate to one, instead of organizing your own Twitter chat. What topics works best, in your opinion? Well, I guess it depends on what you want to talk about. Or on the niche you are working for. Popular topics could be Twitter tools and tips, web traffic, make money online. I find these subjects always popular and hot, nowadays. Now that was interesting so thanks for explaining it. So the program that you sign up with is what can help you organize them. The one I was on I just did the search for the hashtag and then followed the chat like that. It was hard to keep up with at times because a lot of people were pretty much saying the same thing. As I mentioned earlier, I’ve only been on one so far but I hear that it’s a great way to connect with others too. Thanks for this great explanation so at least now I have a much better idea of how they are organized. so glad you enjoyed the explanation in this article. and I am heading right now to the post you linked here with that interesting title! Thanks for sharing this topic for discussion because I need to learn about it! I’ve not really gotten in on this yet, as there’s not really an opening in my schedule to engage any more than I am. I need to keep up with what I’m currently doing and stay consistent in that. Twitter Chats are a great way to increase followers, visibility and authority. I will be glad to participate, if invited. Thanks for taking the time to read and comment here today, Carol. I haven’t been using twitter chat. In facts I know many things are missing from my tweeting because I don’t get much traffic from the medium as expected. I will try the strategy you presented here on twitter chat. Hope something good will come out. You should think to create your first Twitter Chat, Aceclue. Thanks for your comment here today. Great to know you enjoyed this post, and went to check the MyBlogU article too. I’ve not taken part in a Twitter chat or organised one as yet. I keep meaning to check one out but time always eludes me somehow! I didn’t realise there was so much to organising a Twitter chat. It’s really interesting to see all of the different aspects of it. Great that Ann Smarty was there to help you out with it. it may seem really difficult to organize a Twitter Chat. But today I know that after you set up your first one, it’s not that hard anymore. I hope you’ll organize one someday. and have a great rest of this week! I’ve heard about Twitter Chats, but no one has explained it in depth as you did right here! I’ve read some things about it, but you nailed it! Now I have a full understand of how and WHY it works. Thank you so much for putting this together, Another lesson learned for me! I am glad you enjoyed the explanation of how Twitter Chats work. I think they work in a different way. Thanks for your comment, Mian. Really, Twitter chat is an amazing tool to enhance user engagement.. Since,I am using that tool, I found it DAMN useful. Good to know that, Nikhil. Thanks for sharing your experience with Twitter Chats. Yea Erik, Twitter has been a great marketing tool and i am very sure it will remain, in some sense Twitter is more potent in marketing than Facebook. Twitter and Facebook may be used for different purposes. They are both powerful for diverse goals. Thanks for leaving your comment here, Emebu. I’ve yet to do a twitter chat but find it intriguing. So much engagement, so much connecting, so many networking opportunities. Well promoted chats help you pop up on the radar. I always take note when seeing something interesting, chat-wise, and either I’ll follow the flow or click on the hashtag to learn more about what’s being said. It’s almost like a party you want in on, right? I haven’t tried one yet but you made the wheels turn. Definitely some potential for me, and for Blogging from Paradise. I have a large, responsive following and a strong friend network through which to promote the chat. Powerful 1-2 punch, and I believe twitter is the best marketing site for bloggers out there. After my first Twitter Chat, I really “discovered” how this tool is so powerful. Following a hashtag, is like taking part to the party. linking it to a specific hashtag chosen right for identify your blog. have a great weekend in Fiji. It is just like a webinar if you put it into a time limit. While reading the post I just creating the one Twitter Chat and now it is working wonderfully. Social media interaction with specification has now become must as the online community is coming from all parts of the world and it is not possible to be on it at same time. Your timeline update can go to the deep end when I come on a social media according to working hours of my country. Thanks a lot for sharing such a wonderful platform where an online debate with much accuracy and precie can easily be done without any problem. I liked the comparison to the webinar. There are so many things to learn from the participants, like in Twitter Chats. I look forward to see you creating your Twitter Chat and I hope to be invited! Over the years I’ve only participated in one Twitter chat and it’s definitely an area I want to expand my reach into. Before I start my own, I think I will just find some where people are already doing them. It seems like a great way to connect and get to know people. I’m excited about them it’s just hard sometimes adding one more thing to the mix so I need to evaluate what has been working and what needs to change over the next few weeks. Very interesting post and thanks for sharing some great ideas. Ann Smarty was fantastic during my Twitter event, she really helped me out. I can help you manage the questions and the users. Glad you found it interesting, Priya. You’re missing a powerful Twitter weapon, Seema!